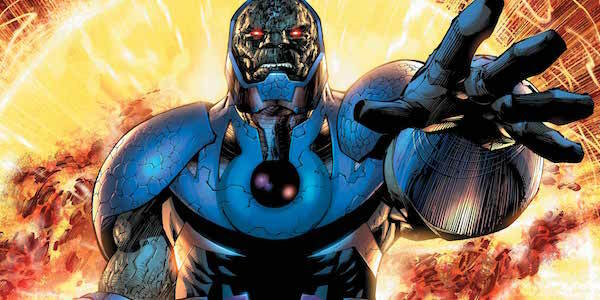 While they don’t mention anything about Darkseid appearing in Justice League: Part One’s present day events, Heroic Hollywood has heard that there will be a flashback at the beginning of the movie of when Darkseid tried to invade Earth 30,000 years ago Apparently the Amazons, Atlanteans and humanity were able to repel him and his forces, but before leaving, he left behind three Mother Boxes, and that’s what Steppenwolf is after in Justice League: Part One. These are the same Mother Boxes from the Batman v Superman: Dawn of Justice deleted scene “Communion,” likely meaning that Steppenwolf was showing Lex Luthor what they looked like so he could help find them. Like the other major characters in the New Gods mythology, Darkseid is immortal, so for him to come to Earth tens of thousands sounds about right, but this battle he had with our planet’s denizens sounds intense. Aside from the Amazons and Atlanteans both being physically powerful, the Amazons also have a special connection with the Greek gods, while the Atlanteans sure have advanced technology at their disposal, so they were by no means helpless. At that point in time, humans were so primitive that all they could really offer is sheer numbers, but either way, it sounds like all this were enough to drive Darkseid away. Now Steppenwolf is returning to collect the Mother Boxes, either on Darkseid’s behalf or for himself. Assuming Steppenwolf fails in this mission, this could pave the way for Darksied finally debuting in Justice League: Part Two. As for the location of these Mother Boxes, don’t forget that one of the videos in Lex Luthor’s metahuman files in Batman v Superman: Dawn of Justice showed Silas Stone using one of the Boxes them to heal his son Victor, subsequently turning him into Cyborg. That could account for at one of the Mother Boxes, but since there was three factions at war against Darkseid, maybe the Amazons and Atlanteans received the other two for safekeeping. This report would also line up with another rumor about Atlantis, the home of main hero Aquaman and his love interest/fellow warrior Mera, appearing in Justice League: Part One. Surely I’m not the only one who thinks there are some similarities to how the DCEU is using Mother Boxes in a similar manner to how the MCU is using the Infinity Stones?